Turn two clock signals into four random gates, in stock now. Branches is a dual random gate - plug any signal into the input, clock, LFO, VCO etc, and it will randomly trigger one output or the other. you can use a knob or CV signal to change the probability that output A or B will trigger, so if you want B to trigger most of the time and A only occasionally for instance, this is easy to do. The module has two of these units. As well as this, a 3rd party firmware called Twigs turns branches into a clock divider, the avr microcontroller specified in the BOM has 8k of flash memory, this means it can run either the stock firmware or clock divider but not both. However, by fitting the 16k or 32k version of the chip instead, you create the possibility of making more elaborate firmware hacks, one advantage of building your own module! In contrast to most of the other modules, which are designed to be built automatically by pick and place machine first and foremost, Branches is designed as an SMD soldering training tool which is also built automatically for Mutable Instruments. The parts are few in number, and very spaced out which makes them much easier to solder than on a PCB like Blinds for instance. 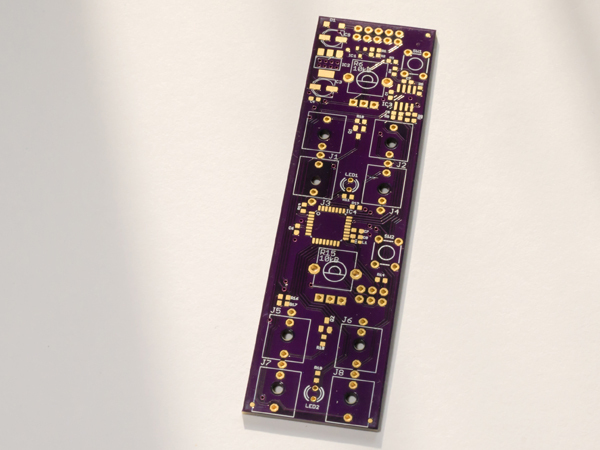 I can recommend this PCB to people who want to learn how to solder surface mount parts before tackling some of the harder projects available here. If you're new to SMD soldering, we offer a free SMD practice kit with your first order, please contact us when you order if you want one. Here's a Mouser Cart BOM for easy ordering of most parts and for costing your builds. Try ordering several projects at once for lowest prices. If you're not completely satisfied, You can return these PCB's for any reason within 14 days of purchase for a full refund! Mutable Instruments do not have time to support DIY builds, please contact me with support queries related to these PCB's.